Senate Majority Leader Jake Corman, R-Benner Township, speaks out front of the Centre County Courthouse to introduce anti-hazing legislation named after Timothy Piazza on Friday, March 23, 2018. Tim's parents, Jim and Evelyn stood with Corman. More than a year and a half after a Penn State University fraternity's hazing led to the death of a sophomore student, Gov. 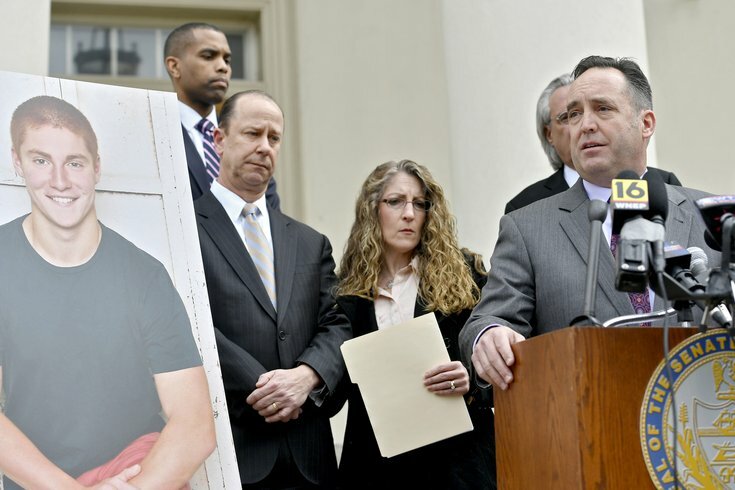 Tom Wolf plans to sign a bill that will enforce stricter punishments for hazing. In February 2017, Timothy Piazza, 19, died at a Beta Theta Pi pledge event at Penn State, suffering several severe falls that led to a collapsed lung, a ruptured spleen, and a traumatic brain injury. Investigations of the incident found Piazza had consumed a dangerous amount of alcohol that night as a result of a fraternity hazing ritual, and that Piazza was unconscious for 12 hours before an ambulance was called for him. Now Pennsylvania law will have stricter guidelines in places for such incidents. The Senate voted unanimously Monday in favor of the bill, which will be named after Piazza. The new legislation categorizes severe hazing as a felony and pushes for schools to put anti-hazing policies in place. The new legislation also offers a clarified definition of hazing, described as conditioning acceptance into a group on breaking the law. Conditions could also include consuming harmful alcohol or food, sexual brutality, beatings, exposure to severe weather, and sleep deprivation, among other parameters. If the hazing practices are likely to injure a person, it would be considered a misdemeanor, while fatal endangerment or potential of severe injury would be a labeled a felony. Senate Majority Leader Jake Corman, a Republican representing State College, is the prime sponsor of the legislation. Corman has noted that charging for the crimes has been difficult for prosecutors because of a lack of outlined penalties. Eight Penn State students were charged in Piazza's death. The first to plead guilty, 21-year-old Ryan Burke, was sentenced to 30 months probation, including three months of house arrest and 100 hours of community service.